“Yodelling is a dying art. Not a lot of people are doing it, but a lot have died in the attempt”, Lynda Topp, yodeller. Why wouldn’t they yodel in New Zealand ? They have big open spaces with lots of cattle and sheep. So it’s not a surprise to find country music with yodel. 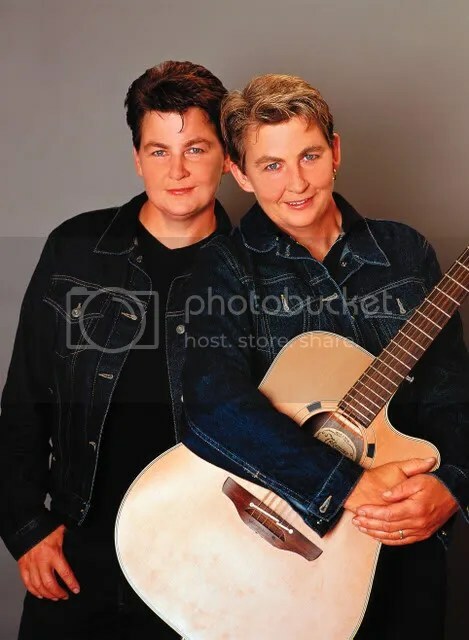 What’s more a surprise is to find it interpreted by lesbian twins, the Topp Twins, who form a comic singing yodelling duo. They have a tv show, they compose country songs and they write and perfom comedy. One of the characters they play are the Gingham Sisters – yodelling spoon-clacking Hillbillies. On their cd Grass Highway, they return to the roots of country music, with two-part harmonic singing and accompanied with guitar, mouth harp and spoons. They have a distinct yodel, full of vocals gymnastics, that appears in romantic country songs. Thanks for your comments and to all the bloggers who linked to me: Pathway to unknown worlds (with a special mention for this article about yodel), Wrath of the grapevine and Monrakplengthai. It really made a difference in visits and I discovered new blogs ! There’s not a lot of activity here for the moment… I have some internet problems, and I’m a bit disappointed for the moment by the absence of comments. I think that a great blog is one where there is a lot of interaction between the blogger and the readers, and that’s not the case here. I know my subject isn’t a popular one but I know on the other hand that some people are interested in it, and still read this blog. The youngest yodeler of the world !? Sometimes you find yodels where you don’t expect it, sometimes it seems so strange and unbelievable… I speak here of a very young yodeler – not really a surprise, just go to youtube and you’ll find some, but in this case, it’s the name of the yodeler that came as a big surprise. And you’ll have to listen until the end of the cd to find it. yes, the jazz musician ! And then, you read his family history and it’s not so surprising anymore: his parents were performers of country and gospel songs, a bit like the Carter Family, who by the way were good friends. 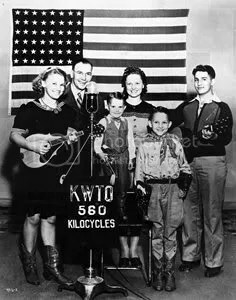 They toured in the southern states of the USA and had a radio show: the Haden Family Radio Show. Charlie began to sing with his family in 1939, when he was two years old. In this song, he even yodels ! It’s full of false notes but so touching ! You are currently browsing the Mademoiselle Montana's Yodel Heaven blog archives for January, 2009.